One look at a population distribution map of Australia and it’s obvious we are a people of the sea. Beaches, BBQs and a curling waves; icons of Australian culture the world over. We’re a nation of surfers, swimmers and sailors; with boat ownership experiencing a year on year rise that now sees 13% of Australian households having some sort of watercraft. It’s a passion we share with our Kiwi neighbours. Auckland is known as ‘the city of sails’ for good reason; playing host to more boats per capita than anywhere else in the world. What then, is stopping the most maritime inclined from making their passion into a living arrangement? There are in fact, quite a few incentives to do so. The cost of a reasonably sized boat is a lot lower than any property you’ll find in an urban centre, and berth costs remain relatively low even in Australia’s most popular ports. Well below any rental property rate that’s for certain. Investing in a boat, even only as a short term living solution, affords certain flexibilities that don’t extend to more traditional forms of property. They’re mobile above all else, so if after a period of water-based living you feel like reverting back to a landlubber, you’ll likely be able to keep your investment close. It also means you can lead a more adaptable lifestyle. If you’re changing jobs or perhaps just fancy a change of scenery, instead of undergoing an arduous move you can bring your home with you. As long as there’s water, there will be a way. You don’t need to be Captain Cook to get stuck in either. Brisbane-based Andrew Bird purchased a boat on the Eagle Street Pier in the cities CBD after being priced out of the housing market. Finding calm in the rough waters of a bad property market. Bird recalls how he found himself living on a boat without any prior sea-faring experience. For those who are, pardon the pun, in the same boat experience wise, take note! Perhaps you’ll take to it easier than you expected. His tale is one that does a lot to challenge other preconceived notions of life on the water. He points out how much larger boats are than they often appear, his own sleeps six, and how despite some small inconveniences (fetching fresh-water, running a generator), the conveniences and pleasures of city life can be kept close at hand without having to pay CBD housing rates. Even the issues Bird highlights are becoming less of a concern. The creases of seafaring life are being ironed out over time by solar panels and desalinators becoming cheaper and readily available. 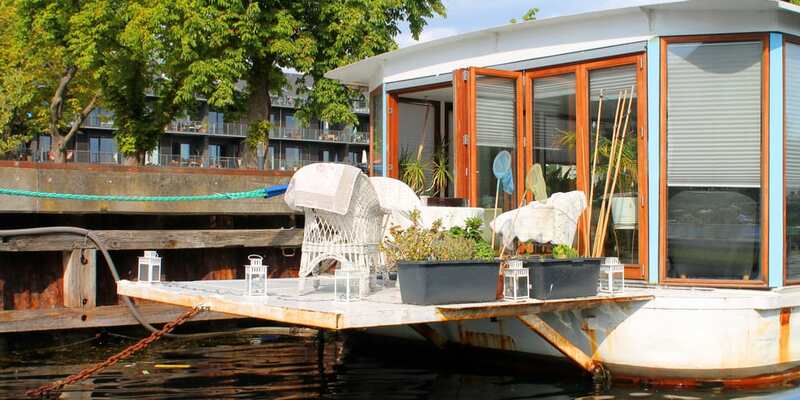 Some enterprising folks have attained a level of self-sustainment through these methods that enables them to live on the water for years at a time. Combining work, home and travel into an all-in adventure. It’s also a very environmentally conscious way to live if that’s important to you. Even for those who like to travel around, wind power is always free and green. For the savvy investor, living on a boat might be a form of pseudo-rentvesting. Which I’ve talked about more in depth before. With a cheap primary place of living you can direct your capital into an investment elsewhere to rent out. Living on board and offshore isn’t entirely clear cut though, there are some regulations that vary from state to state. In Queensland you’re limited to a four month stay in one bearth, and then you’ll need a 30 day gap before you return. There have been some pretty severe crackdowns on those who are overstaying. Elsewhere you’ll find things more relaxed, Tasmania puts no such restrictions on things. It seems like a slightly silly consideration, and maybe it is, but it can’t hurt to give it some thought. You’ve got to be flexible and willing to move about and adapt. If that’s you, why not give the high seas a moment of contemplation; either as a fun side investment or something a little more life defining. You might find your horizons expanded. Quite literally.